I always write the same thing this time of year. I love it because of the hopefulness if offers. I think that you can see it in people's faces and feel it in their actions if you pay attention. Maybe it's just me, but I look forward to the new year almost as much as Christmastime. I have spent most of the past year baking; building, slowly but surely, the cupcake company. Therefore, I have spent very few hours at the sewing machine. Last weekend I had a break and decided to make this table slip for the chest that we use as a coffee table in our living room. I adore anything scalloped. Please note that this is far from perfect…as is everything I do. I would change about ten details about it, including the method I used to create the scalloping. But it was my first time and definitely is a start. 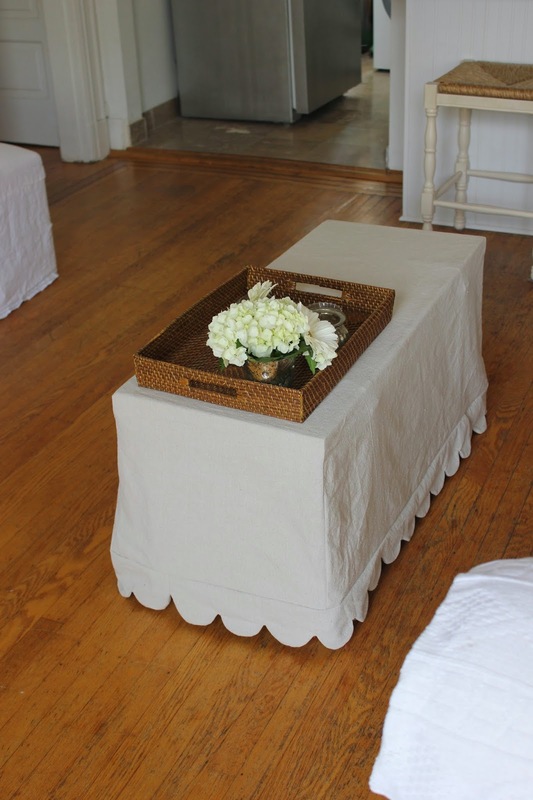 I used a drop cloth, which I have never worked with before. I am reasonably pleased with it. Admittedly, I am spoiled though, as I have worked with nothing but vintage as well as new linens for the last four years. 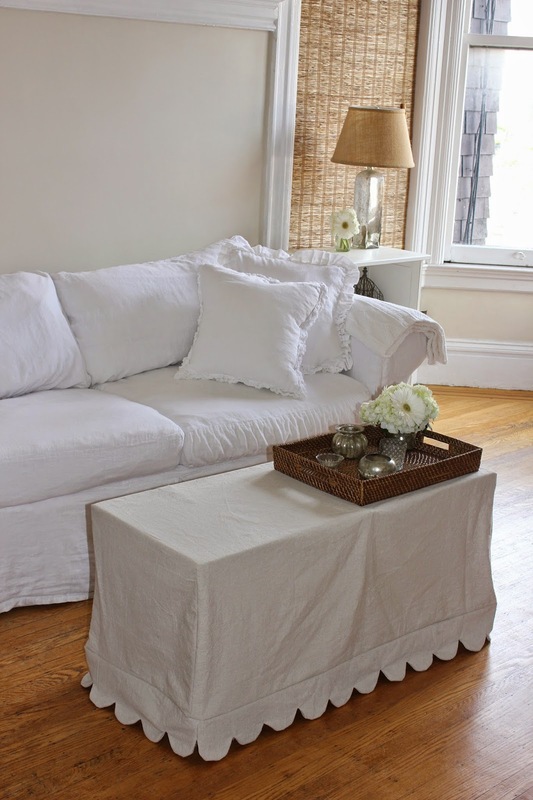 Next I am going to make a fitted table cloth out of white linen. This time I will use a different process to create the scallops though. Hopefully it will look a little better. Also, a customer of mine ordered a grain sack euro sham. I didn't have any in stock so made this one for her. I am thrilled with how it turned out!! I hope she likes it as well. These sacks are usually 18-23" in width. So I had to add side panels to accommodate the a euro insert. I love that I was able to keep the original ties intact. Also, I like that the stripes are navy while the monogram is sort of French blue. You know I have always admired your sewing so I am happy to see that you have returned to it. Your home is beautiful as always. A wonderful new year you wish! I follow your blog for a long time. I like everything. I like especially how you write. And it's an enviable talent indeed.